Whether polished obsidian, bronze or metal-backed-glass, we have been gazing at our reflection for thousands of years. 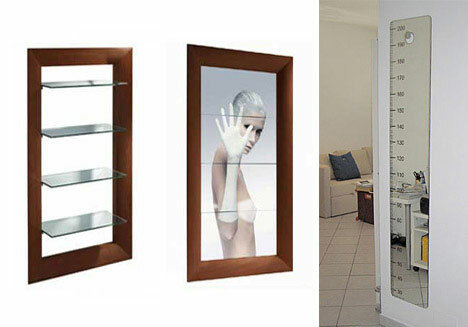 Still, mirrors are somewhat behind the times when it comes to creative and off-the-wall modern furniture designs. But while mirror mirror on the wall still holds true in most cases (we have yet to think of a better place for it), designers have never been more playful at exploring new design concepts in mirror-making. 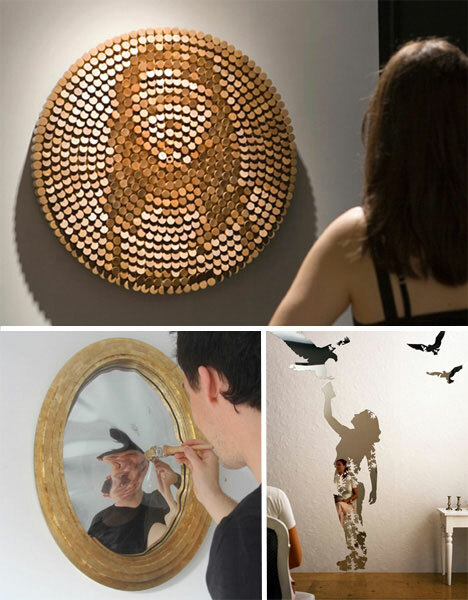 Here are 16 unique examples of new mirror designs that one would expect to find lurking with Alice in Through the Looking Glass. Want more funky designs? Click here for 90 amazing houses to hang these in or here for more geeky art to gawk at. Whatever a mirror is made from, it has to be reflective, surely? Not if you think laterally. Daniel Rozin‘s creations get around non-reflectivity by interpreting the image from an outward-facing camera and converting it into subtle changes in an array of small side-lit objects – in effect, pixels. 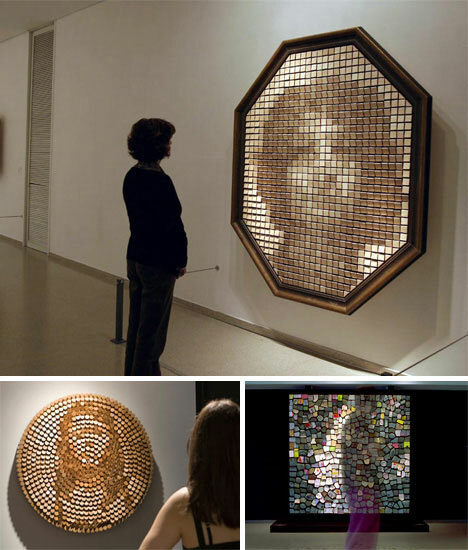 The result is mirroring made from wooden blocks, wooden pegs, ball-bearings and even lumps of trash. See the wooden mirror at work here (Quicktime required). Converting the humble wall-mirror into something rarely seen outside a funfair, the Flect Magic Mirror warps and contorts when you run the magnetic “magic wand” over it. When you have finished twisting your reflection hither and thither, remove the wand and the mirror springs back into shape. All the fun of “breaking” a mirror without the seven years of bad luck. 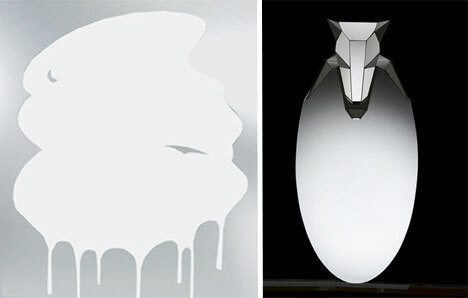 Images: Philippe Starck and Juanco. What else can a mirror be? Here are two designs that reflect on this problem. Philippe Starck evidently believes that it can be a set of shelving that subtly encourages you to tidy up after yourself. Juanco‘s mirror has a built-in tape measure, neatly stepping around the need for another person in the room when you want to check exactly how tall you are in your new shoes. Seeing yourself head-on is all very well, but hair-styles wrap around. 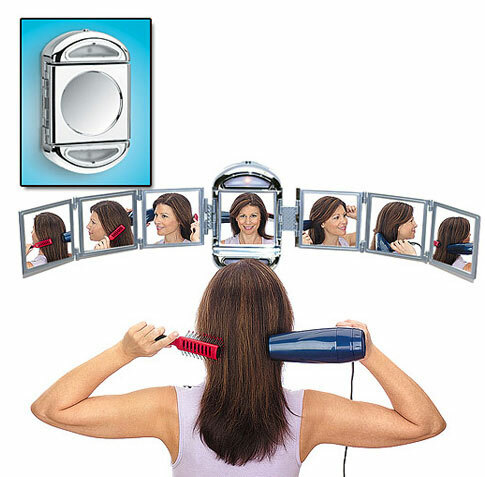 A sensible alternative to awkwardly working a hand mirror behind your head is this 360 Degree Mirror – except it’s only 180 degrees, and surely they’ve got their reflections mixed up there? However, no denying it is a great concept. Images: Claire Requa Design and Iggloo. One theme, two perspectives. On the left we have the Chandelier Mirror, adding a touch of Phantom of the Opera to your decor. And on the right, its mirror-image, the Mirror Chandelier – a pendant lamp that wouldn’t fail to stun if it was surrounded by candles or positioned to catch firelight. Images: Afroditi Krassa and Domestic. Convention dictates that a mirror is a single unbroken surface. Evidently these designers don’t hold much truck with convention. 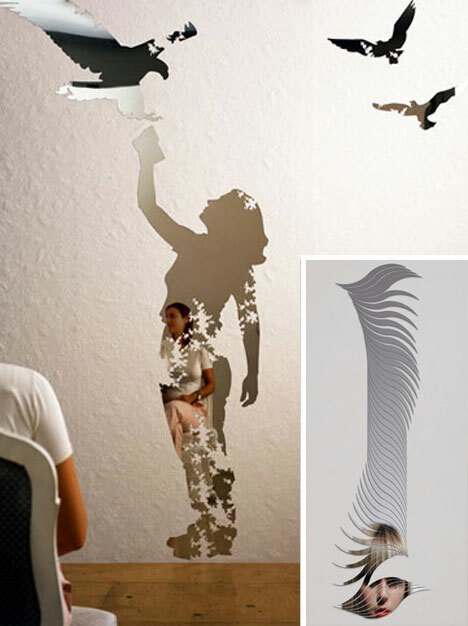 Afroditi Krassa works with mirrored sculptures, working mirrors into images of her design to hold images of yours. Alternately, this mirror from Inside IDSland appears to be cascading gently off the wall like a giant, feather-like Slinky. For traditional single-surface wall mirrors, there are two directions to go. 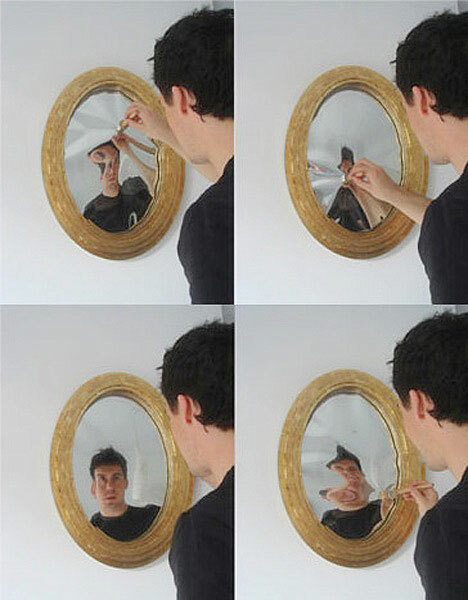 The Wipe Mirror goes down the quirky route, simulating what you’re forced to do when the mirror’s too fogged up to be useful. The stunningly clean-lined Dog Head mirror from TranSglass® seeks otherworldly sophistication, looking less manufactured than CGI-rendered. Images: Soner Ozenc and Oregon Scientific. Mirrors for the geekily-minded. 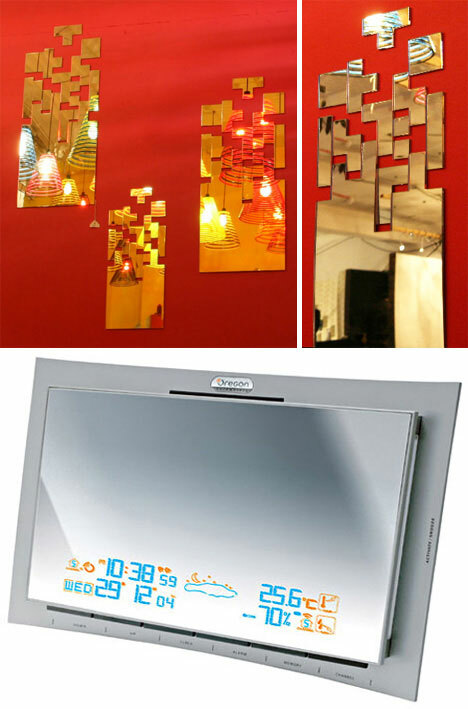 A tribute to the maddeningly addictive puzzle game by Alexey Pajitnov, the Tetris Mirror will have you whistling that theme tune as you brush your hair – and Oregon Scientific’s grandly-titled Mirror Weather Station will be able to tell you the likelihood of whether you will need a coat to two decimal places.